Piotr Paleczny is an outstanding Polish pianist and professor, winner of top prizes at five international piano competitions. He studied piano at the Frederick Chopin Music University in Warsaw under Professor Jan Ekier. Artistic contact with Arthur Rubinstein and Witold Lutoslawski had a huge impact on his artistic development . Since his success at the 8th International Frederic Chopin Competition, he has had a wonderful career, constantly performing concerts in all continents. Piotr Paleczny has performed with the Chicago Symphony, Royal Philharmonic, Concertgebouw, BBC Symphony, Gewandhaus, Tonhalle Zürich, Yomiuri Nippon Symphony, Santa Cecilia. 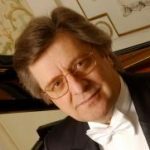 He has frequently served on juries and been chairman at many leading international piano competitions, including the International Chopin Piano Competition, Tchaikovsky Competition, Leeds, Cleveland, Tel Aviv, Los Angeles, Vienna and many others. He has recorded numerous CD’s with EMI and BBC Classic, Naxos and two of his National Edition Chopin albums achieved Platinum and Gold Disc status. Since 1993 he has been the Artistic Director of the International Chopin Piano Festival in Duszniki Zdrój and since 2004 Artistic Director of the International Paderewski Piano Competition. In 1998 the President of Poland conferred on him the title of Professor. Piotr Paleczny conducts the piano class at the Frederick Chopin University of Music in Warsaw.